I have been a fan of Anna Godbersen’s books since she first published. Her descriptions of life in New York were amazing, and she is a graduate of Barnard College, as am I, which made me enjoy her work more than ever. When my husband brought me her latest book, I was looking for more about life in New York City more than a century ago. Boy was I wrong! The Blonde is something else entirely. This is a story set in time I remember well. We meet a struggling Marilyn Monroe, who was a constant figure in the news and pretty much a part of the lives of movie goers and news features. She was a beautiful woman, an unhappy woman with multiple marriages and a drug problem, and someone who was a lost soul. The book shares that, but it also shares something else. In general, we also knew that Senator and later President John F. Kennedy was something of a philanderer. But this book ties Marilyn Monroe not only to his philandering, but also to the assassination of Kennedy. I had seen television shows that included Marilyn Monroe singing “Happy Birthday” to JFK, but I was probably too young to connect all the dots. Almost everyone of school age and older remembers where they were when the news of the JFK assassination spread. People were glued to the television, watching the swearing in of President Johnson, seeing Lee Harvey Oswald and Jack Ruby. The funeral was on all televisions. What followed were investigations which somehow never seemed to completely explain what really happened. Anna Godbersen has created her own theory. Not only is it plausible, but it is told beautifully. Sometimes the real story is, in fact, stranger than fiction. If for no other reason, read The Blonde just to enjoy a mesmerizing story that will leave you wondering. Check the WRL catalog for The Blonde. To be fair, I was not a major fan of Meryl Streep. I know there were many who would disagree with me, but it wasn’t until Out of Africa that I was hooked. And I’ll admit that my original attraction to that movie was Robert Redford. But as I grew up, I really learned to appreciate her talent and flexibility, and I became a fan. I came across Plenty and decided to watch, and I am glad I did. She did an amazing acting job in this film. The movie starts when she, as a young girl, is part of the Resistance in World War II. After the war, she becomes enmeshed in English politics and the good life, but something is missing. Her attempts to have a child out of wedlock fail. Her relationships with men are not easy. Ultimately she marries well, but is still dissatisfied. In some ways she is a victim of her time. During the war, women assumed new roles, but after the war they were expected to revert to pre-war roles. It was not a happy transition for many. Her attempts slowly lead her into behaviors that are not yet acceptable in society. This leads into a stronger descent to mental illness, or at least what the prim and proper consider mental illness. This is not a happy movie and does not have a happy ending. However, I think it is a realistic view that portrays how many women felt in the times. The whole cast is amazing; every character does a superb job of acting. Plenty, in many ways, shows the real beginning of the women’s movement and foreshadows the future when women will take control of their lives. It is a bit of history we generally ignore, but our lives today were certainly changed by the characters in this film. Check the WRL catalog for Plenty. America Singer lives in llea, which was once the United States, but now is a country with a caste system, a monarchy, and lots of rebel groups. Her family is in the third caste, which is not great but is also not terrible. However, an opportunity to better their lot appears when the Palace sends out a call for The Selection. Each province can send one young woman to live in the palace and vie for the honor of marrying Prince Maxon Schreave. Sound familiar? Yes, it’s the Bachelorette meeting royalty in a dystopian land. But, you want to keep reading. America also has a secret. She is in love with Aspen, the son of a neighbor who is in a lower caste. They meet secretly at night in a tree house in America’s yard. Aspen is the sole provider for his family. He is constantly working and is always hungry. As America’s family keeps pushing her to enter the contest, Aspen seems to be withdrawing, indicating hat he has found another woman. America finally agrees to enter, and, of course, is selected. The characters were interesting and constantly developing. Plus the descriptions of everyday life in the castle, including clothes and meals, were wonderful. The relationships among the women vying for the Prince’s hand provide humor and some intrigue. Equally intriguing is the relationship that develops between America and Prince Maxon. She is completely up front with the prince about not wanting to win, while admitting that she’d like to stay, if only for the food and clothes. Prince Maxon is obviously interested. Enter Aspen who is now a military guard. America is caught between her feelings for Aspen and the Prince. How will it end? We need to wait for the next book. The Selection ends with us waiting to see who America will choose and how it will work out. And I do want to know. The Selection has also been selected for a possible television series. Kudos to Kiera Cass on her first novel with Harper Teen. And if you like her work, read her first book, Sirens, which was self-published. You won’t be sorry. Having just read Anna Dressed in Blood by Kendare Blake, I planned to blog about it. However, my colleague Jennifer D. had already done that. After reading the book and Jennifer’s post, I started thinking about all the paranormal literature that is being written for young adults, and how teens respond to it. While it is relatively new to today’s teens, after years of books like Sweet Valley High, supernatural fiction obviously isn’t all that new. We’ve had horror classics like Dracula and Frankenstein, but there were also popular supernatural romance stories in the 1940s and 50s. After World War II, Daniel Bubbeo wrote a play, The Enchanted Cottage, which was partly written to ease the pain of the disfigured veterans who were returning home. The plot was simple—a homely maid and a scarred ex GI meet in a cottage. They decide to marry more out of loneliness than love. As the relationship deepens they become more and more beautiful to each other. The movie, starring Robert Young and Dorothy McGuire, with the help of an able make-up crew, actually shows the transformation of the characters. And who can forget Portrait of Jennie. Eben Adams, a struggling artist, encounters a young girl in Central Park named Jennie who prattles on about things from the past. Just as Eben is about to ask her some questions, Jenny disappears. She reappears in future months looking a bit older each time. He paints her portrait, which turns out to be the turning point in his career. Eben also uncovers information that tells him he is falling in love with the ghost of a girl who perished during a hurricane years ago. On the anniversary of the hurricane, he rushes to the site where she supposedly perished. As a new storm approaches, Jennie disappears for a final time. Eben is almost convinced she was a figment of his imagination, until he realizes he is holding her scarf in his hand. He also realizes that their love will endure through the magic of his portrait. Anna Dressed in Blood has the same emotional content as The Enchanted Cottage and the Portrait of Jennie. The difference is the violence in Anna Dressed in Blood. It makes me wonder if today’s books mirror what’s going on in our world. We seem to be a society filled with random violence, which is reflected in the literature. The question becomes: can an old fashioned love story stand on its own? Today’s post is by Youth Services Director Noreen Bernstein. Dystopian worlds are hot, and books about teens living in some sort of dystopia abound. The trick is finding the good ones that blend the normal day-to-day things with the fantastical and make it believable. Beth Fantaskey does this deftly with charm, wit, and a voice that resounds for both teens and adults. Jill Jekel is your ultimately good teenage girl who is smart, nice, and not so popular. Her father’s murder and her mother’s descent into severe depression leave Jill pretty much on her own to cope with everyday things. On top of this, Jill learns that her college fund has been depleted, presumably by her father before his murder. Tristen Hyde, a newcomer to Supplee Mill High School, is a bit mysterious, very handsome, and the one person who comforts Jill at her father’s funeral. She is not sure why he came and why he seems interested in her. Yet she is drawn to him for reasons she does not understand. Tristen is haunted by dreams he does not understand. When Mr. Messerschmidt, the high school science teacher, announces a science project contest attached to college tuition, Jill is interested, hoping to work with Tristen, who unfortunately does not seem interested. When Jill mentions a box of papers in her father’s study that were secret, Tristen changes his mind and they start working together on the project. Added to the mix is a complete breakdown by Jill’s mother who turns to Tristen’s father who is a psychiatrist. Everyone in this book has an agenda: the likeable Jill who is falling in love with Tristen; Tristen with his nightmarish memories who is falling for Jill, but afraid; and Tristan’s father who wants power through his son; even Mr. Messerschmidt has a surprising role that is only disclosed at the end of the story. It is a painful mix for all, that creates tension for the reader wondering who is the good guy and who is the bad guy. The climax, while somewhat predictable, has enough twists and turns to keep the reader wanting to know how it will all turn out. 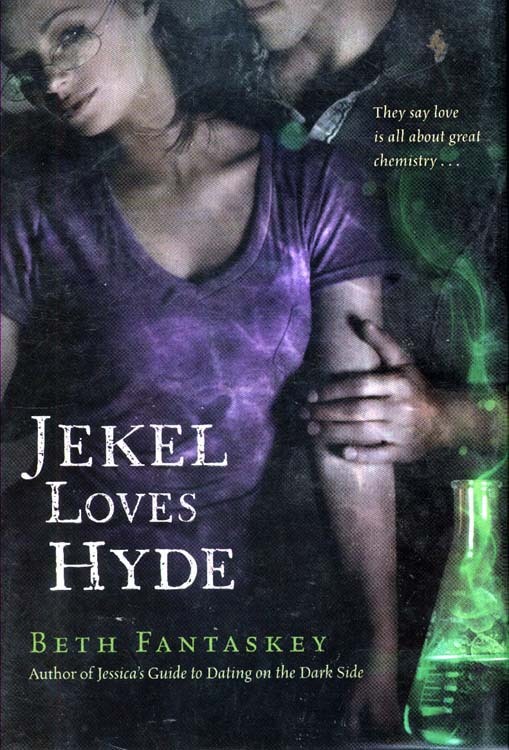 As mentioned on the book cover: “They say love is all about great chemistry.” — Jekel Loves Hyde has enough chemistry paired with teenage angst and a touch of the unreal to keep readers turning the pages. This could even cause readers to check out the original Dr. Jekyll and Mr. Hyde. Today’s post is from Youth Services Director Noreen Bernstein. In this time of werewolves, vampires, zombies, and dystopian worlds, it is refreshing to find a teen novel about real people and a real time. Allie’s story starts in 1939 when she is living with her mother in Tennessee. Her mother is suffering from brain cancer and Allie is coping as best she can. Her neighbor Sam tries to help but Allie is not sure that she wants his assistance. Sam has a crush on Allie but she is too wrapped up in caring for her mother to care. And on one of the days she does spend time with Sam, her mother dies, leaving Allie alone and thinking that if she had been there she could have saved her mother. Allie is adopted by Miss Beatrice in Maine. After a brief transition period, the book moves to 1943. While Allie has adapted somewhat to her new life, she still holds onto her mother, her mother’s fervent belief in atheism, and her need to keep her emotions carefully hidden. She does find friends at school, and becomes somewhat close to Miss Beatrice’s older daughter. And who returns to her life? Sam, who is visiting a relative living next door to Miss Beatrice. A new relationship begins between Allie and Sam. The book is set against the background of World War II and includes all the emotions of teens growing up and finding their place in the world. The developing relationship between Allie and Sam, while a little predictable, rings true as does Allie’s search for the meaning of life and for a way to hold on to her late mother while learning to accept the love of Miss Beatrice and her new friends. 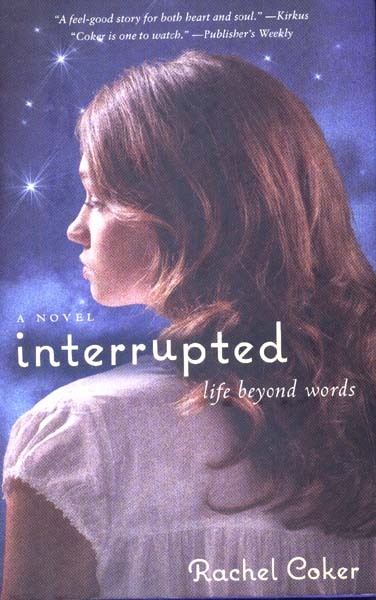 Interrupted is a first novel by Rachel Coker who is 16 years old and a longtime user of Williamsburg Regional Library. As a children’s librarian at WRL for many years, it is amazing to read a book written by a young lady we’ve known as a child. Seeing a library user grow up and produce a book that has been well reviewed and is well worth reading is the perfect gift for those of us at Williamsburg Regional Library. Interrupted is a good read for younger teens as well as adults. The characters, setting, and emotions are real and many teens will identify with Allie, Sam, and the other characters. Check the WRL catalog for Interrupted: Life Beyond Words. The sequel to Jessica’s Guide to Dating on the Dark Side finds Jessica married to Lucius Vladescu and living in a castle. In many a story this would be the beginning of happily ever after, but not for Jess. She has to prove herself and claim her throne by convincing the Vampire nation that she is capable and can rule. Everything is hard, even ordering food, speaking the language, and figuring out who is for and who is against her. When Lucius is accused of murder, her one rock is gone. Who can she trust? Her uncle and his daughter who seem to care, her best friend Mindy who has come to stay and help, or Lucius’s Cousin Rainero Lovatu? Can Jessica save Lucius and herself? As the story unfolds we learn more about Rainero and Mindy, who have established their own relationship full of twists and turns. Uncle Dorin seems to want to help as does his daughter Ylenia. We are drawn into the morass of problems and responsibilities Jessica faces. Can she prove herself worthy of becoming Queen? Beth Fantaskey has created a fascinating Vampire world inhabited by memorable characters. Even Jessica, who sometimes seems wimpy, is real and believable. And, while Jessica does ultimately rise to the occasion, the book ends before we know if she will actually become Queen. The book is beautifully written and staged, leaving the reader hoping for a third book telling us how it all ends for Jessica and Lucius, Mindy and Rainero, and Vampire nation. 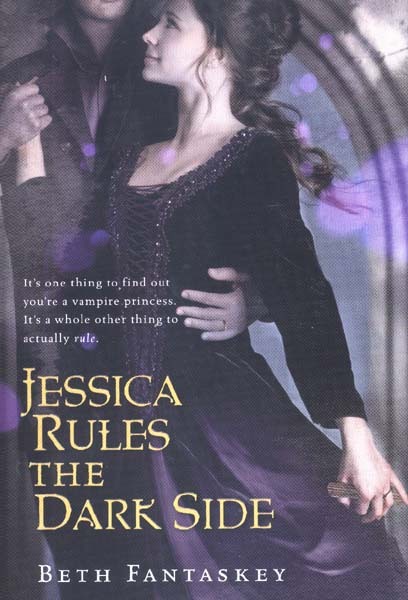 If you read Jessica’s Guide to Dating on the Dark Side, you should visit Beth Fantaskey’s web site and read about The Wedding before reading Jessica Rules the Dark Side.